Do you believe in God? Regardless of whether you do or not, your values are influenced by religious values whether you like it or not. If you are a believer, an agnostic or an atheist does not matter. It is Christmas and it is said that 2000 years ago a boy was born in Bethlehem. Surprisingly the number of people who believe in Jesus has never been larger and the number increases every day, the secularisation project that has been successful throughout the 20th century seems to be waning in favour of Christianity and Islam. The way religious values appear today they are divisive. They give rise to conflict and are likely to continue to do so. Politics bear a great part of the responsibility of bringing us to this point. If we imagine a future Europe and Sweden with less conflict for ourselves a lot of things need to change. In this article I will discuss how religion impacts our values and what differs between religions from a values perspective. The source is large open databases that I have used for unique values analysis. I dare say, rather “unswedishly”, that no one has done this before. In a previous article I demonstrated that Swedes have northern European values and share a lot of these with Germans, these values have become norms, laws and societal systems, a conclusion that was surprising to some. Can we really be this similar to our Germanic neighbours? What unites us with them? One answer may be religion, Protestantism has been a part of both countries for over 500 years and has left its mark . To create comparable material I have used people with similar levels of education and income, people born in other countries have been excluded. The results are summarised in the following section. Based on a study with almost 300 000 individuals conducted between 2006 and 2014 in 28 European countries. The total number of participants left in the study after this exclusion is 84 475. 28 European countries conducted 2006-2014. With similar education (11-14 years) and approximate average income (3-6 decile). All born in the country (no immigrants). Compared to the average there are few things that stand out about the Catholics. Perhaps they are slightly more interested in tradition, but in general they are surprisingly boring. Where did all the passion and pietà go? Balance, long-term and eternity may be the most notable. Despite Protestants being individualistic there is a marked aversion toward claiming your dues. The right of the strong must be modified and tempered and the principle of this is the separation of powers. Fear of conflict is clear, while pleasure and development are wholly in line with Protestant values. The legacy of Luther is obviously undeserved and erroneous. 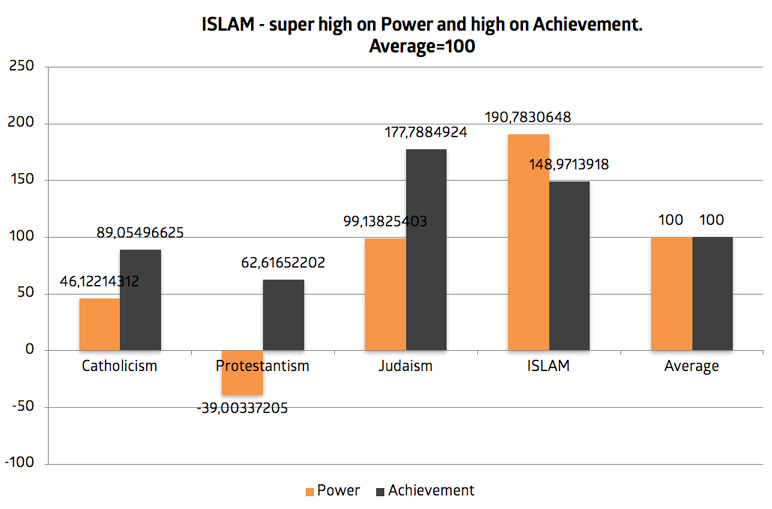 Power values like dominance, prestige and control are twice as strong among Muslims compared to the average. Taking what is rightfully yours, claiming your place and being victorious are central. In combination with a strong interest to succeed there is an overwhelming drive to reach the top. Weakness is less accepted and universalistic values, are much less interesting. Beyond this families and close friends are valued. Jewish values are focused on achievement, and as such are reminiscent of Muslim values. On the other hand Jews are more interested in hedonistic values like pleasure and satisfaction than other religions. Regardless of whether we look at level of religious fervour, age or educational level these differences in values remain. They are not diminished they merely move on the scale. A highly educated Muslim becomes slightly less interested in power values, which is also true of a Protestant with high education. 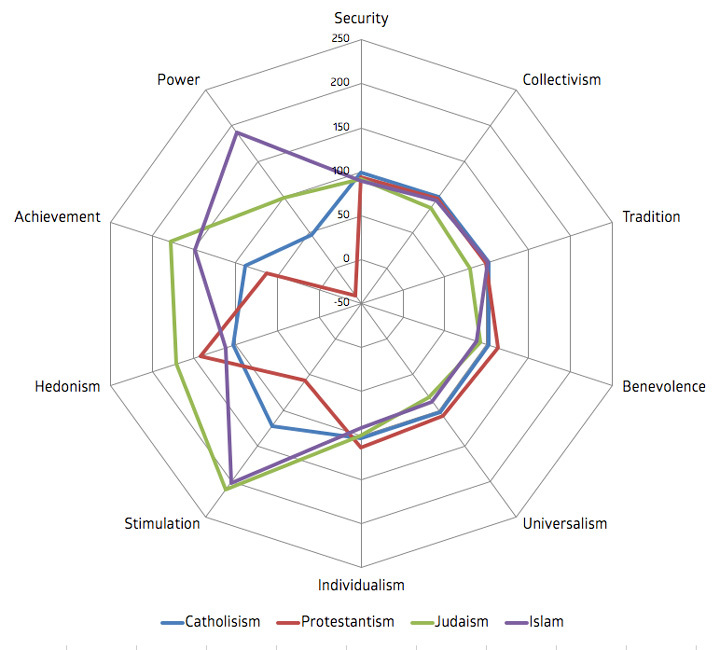 A Protestant with low income is slightly less individualistic, meanwhile Muslims with corresponding levels of income are even less interested in focusing on the individual. People who are non-believers are influenced by their original religious home. The Protestant, Catholic or Jewish traits remain. The levels are slightly changed but the differences are basically the same. Is secularisation the only way? War and conflicts in the name of religion have always existed. In this light religion is a vulgarity. So far the alternatives have been worse. Communism, Marxism but also Nazism are three ideologies that reject religion. Humanism has not been able to attract sufficient numbers with its questioning scientific viewpoint. Perhaps Sustainism with its focus on the environment may have some potential. There are religious values and they will continue to affect us now and in the future. What consequences will this have? 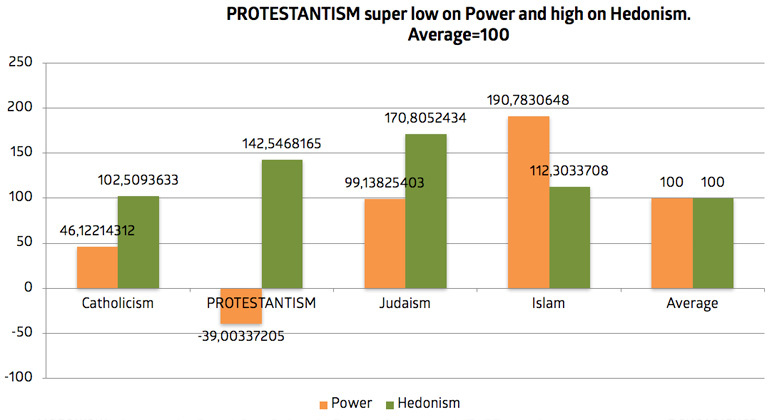 The Protestants uneasiness towards power could threaten its existence in the long run. Strong individualism and an disinterest in defending oneself does not a strong fortress build. 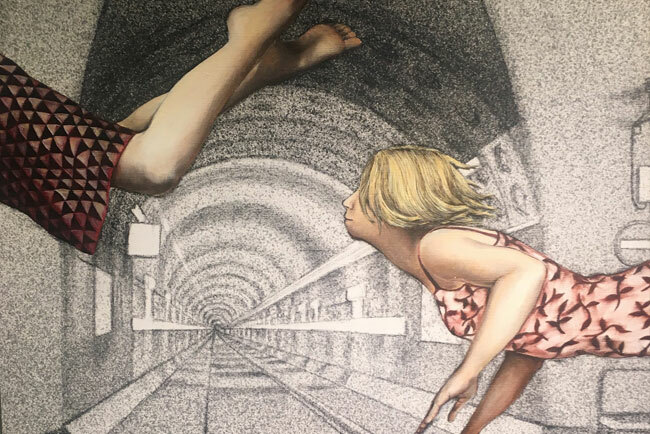 Focus on the world around rather than ones own life conditions give rise to relativism that will allow even things that threaten basic values like freedom, equality and openness. The Muslims disinterest in compromise and belief in the idea of might is right may be a challenge within the framework of a liberal democrat regime. The values associated with the Jewish faith ensure that they will remain an important force in Europe and the world. Catholics are the ones who are the most moderate, eternal and boring. Conservative, but not without dynamics. If I were to return to the world in 500 years I think it would still be a significant power, maybe to a greater extent than any of the other religions. Roads to the future – the role of religions in society. We see clear avenues of development for the role of religions in society in the future, based on our big-data system Q-Ball that is based on several hundred million web pages and over 3 billion social media posts. Among these is an avenue we can call synteism and the apparent secularisation. We will however not delve into these avenues to the future in this forum as this would make this article too long. Below is a simpler analysis of a possible scenario for the year 2040 to indicate general societal developments. The number of non Christians (and Christians) is as high in Östermalm as in Fittja or as high in Ixelles as in Molenbeek. • Many cities have had a conscious plan for integration and to break societal structures that have persisted for 100 years. • Religious private schools that cement religious values have come into question. If they are to exist they must offer opportunities for young people to be inspired by other influences. • Empirical data shows that people who are unemployed have much more marked religious values. Because of this any job is more important than the right job. There is great flexibility in the labour market of 2040. • It is not a decree from god that Muslims should love power values and that Protestants should hate them. A de-politicization of the religions has taken place after an increase in differences and values based conflicts during the 2010s. Now there is a consensus that power is important, but the democratic system can never be challenged. This is an endeavour that must take place on many levels, internationally and nationally. It is entirely possible. The question is if there is a will? Among politicians, business, citizens and, last but not least, among religious leaders. What does it matter if we become Catholics or Muslims in a couple of hundred years time? In what ways do religious values define us? All values create different types of norms, laws and behaviours. There is a reason that gender equality and equality has flourished in societies espousing Protestant values. Individual rights and the liberal democrat system seem to enjoy places where Protestant values are strong. Religious values will give rise to war and conflict even in the future. If we begin to acknowledge differences in values, as well as similarities, we will be in a better position to preserve that which is worth preserving. The question is on which side we will stand? More than 2000 years ago more than a boy was born. It was then that the values that I and perhaps you have opened their eyes, stood up and began to roam the earth.